Did Cueball fasten the ladder to the structure? A little music for Megan & Cueball while they . . . wait for it. 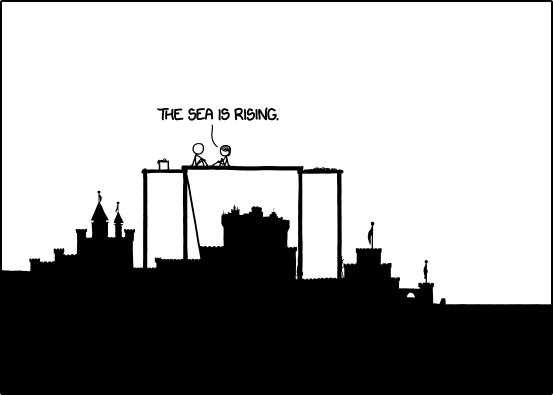 Compiling a proper bible: http://xkcd.com/303/ ? But to be a little more serious; what should it be based on? How should it be made? Still some time till we reach the distance of 50-80 years 900'000 -1'400'000 newpix they had last time the Bibel was written? Yeah well this bible could get kind of long... May be best to keep it in mostly digital only form as I don't need that much toilet paper big a book. Was thinking the easiest method would be to just use a forum. Could even be this forum if we had a new section added (which I doubt the admins would want to give us but who knows) or else a whole new forum. It would work much the same way as this "Individual XKCD comic threads" folder works. There would be a new thread for each page with basically the same posting rule for the first post of each thread with just the IMG. Then you get people to download each png file and use Photoshop/Gimp/whatever to modify and then upload the result as an attachment to the thread. They would have to agree to license it back with creative commons non-commercial license 2.5 as well. Then others can view it and comment on what they like or propose what they would like added instead. Some people can just propose words or captions to add and then others can render out the images. The output must always be the same size png file. Might be also good for posters of images to also state their name and credit anyone who helped them so this data can be included in the final output as well. Then you can re use any of the many animated gif or other websites that have been set up already to view the orginal png files to render the new version of the Bible with just the change of the the image server web address. Also in theory if there are more than one opinion of what version should be in a bible more than one person can host it and you would then have different version of the Bible for different factions. Also could create a script to auto generate the initial IMG thread posts which would make things simpler. First do all 530+ initial ones and then auto add the rest each newpix. The great thing is it can start with only a few dozen custom ones and grow from there. Isn't this a problem that cries out for a wiki? This may at first glance seem off-topic, but it prolly isn't. I have a question about Echoes on the Meddle album by Pink Floyd. Is there something wrong with the first note? It seems to start too late. Exodies wrote: This may at first glance seem off-topic, but it prolly isn't. I have a question about Echoes on the Meddle album by Pink Floyd. What do you mean? Do you mean the very first note of effect-laden piano, which given that it's by itself and not entirely timed, can't really be late in any meaningful way; or where the guitar enters or where the drum enters in the intro, or where what I'd think of the song proper beginning? Incredible song, in any case. Wonder if they are having a staring competition to see who has to go down to fix the ladder. I would suggest that each page end in the middle of a critically important sentence. Just for keeping up the suspense. Perhaps even more evil would be to omit page numbers and send the pages across multiple delivery systems (postal service, email, carrier pigeon). Then see how many split sentences could be devised that could be recombined in ambiguous ways. Yeah a wiki would be another great solution. Would probably want to make it a login required to edit wiki as wiki spam is a real pain. ...Print each page at an individual brick, and send/deliver one per day at allmighty Randall's front door? Last edited by Jafloi on Thu Apr 11, 2013 10:31 am UTC, edited 1 time in total. And yet here we are, still waiting for it. Everyone seems quite caught up about religion, and yet nobody noticed that these last few panels, with them sitting up there, have been pretty similar to the very first ones, where the only change was Megan turning her head. Perhaps Randall has figured out how to manipulate time such that it is, in fact, still April 1st. Sort of like an inverted "Groundhog's Day", where in this case we only think time is moving forward. Interesting thought, there is really a striking similarity... but what then with the dialogue in frame 531? TemporaryLife wrote: Everyone seems quite caught up about religion, and yet nobody noticed that these last few panels, with them sitting up there, have been pretty similar to the very first ones, where the only change was Megan turning her head. I think we are all just overwhelmed by the awesomeness of sending the bible one page at a time. Makes it much more compelling to write the bible. seraku wrote: Perhaps Randall has figured out how to manipulate time such that it is, in fact, still April 1st. Sort of like an inverted "Groundhog's Day", where in this case we only think time is moving forward. Is it possible that the box on the left side of the structure is actually a lunch-basket, and they are out for a picnic? I planned on just chalking that up to the exhaustion that one might experience after building a small castle, a bit more, a bit more, a LOT more, destroying part of it, rebuilding, building more, destroying... you get the idea. I imagine they just want to relax now. Who knows? I was mostly just observing that these minimally changing panels have them doing the same thing as the beginning. Bookending is definitely the kind of thing that Randall would do. As a side note, I was going to ask if anyone felt gypped that we didn't get an April Fool's thing like we normally do, but then I realized that we got THIS, which is way better. TemporaryLife wrote: As a side note, I was going to ask if anyone felt gypped that we didn't get an April Fool's thing like we normally do, but then I realized that we got THIS, which is way better. ...You didn't see the April 1st strip? Hardly any difference with the previous Frame... Time for something spectacular! "Nothing much else happened, all the rest of that night." ...though of course I'm a little vague on the meaning of this "night" he mentions. Last edited by jjjdavidson on Thu Apr 11, 2013 11:30 am UTC, edited 1 time in total. They can't lift the ladder because the bottom is trapped in the sand, and the top is trapped between the post and the plank. They will have to lift the ladder end of the plank to free the ladder, or one of them descend the ladder and dig out the bottom. jjjdavidson wrote: "Nothing much else happened, all the rest of that night." And then, it happened again. Neil_Boekend wrote: Please do not make me a member of the Western Paradox Church. I have just had a visit from the future and I told me I never became one. Membership is automatically granted in such cases. (Un)Welcome to the Church! Re: ladder- perhaps he's waiting for it. buffygirl wrote: Thank The Randall, I have caught up with the scrolls of The One True Comic. I fell behind for many manly TimeFrames, and am, for the moment, caught up. Ah, I see the wisdom in your Cardinalish ways: You're making us Wait for It! Oh, in that case I'll go and kill my ancestors. htom wrote: They can't lift the ladder because the bottom is trapped in the sand, and the top is trapped between the post and the plank. They will have to lift the ladder end of the plank to free the ladder, or one of them descend the ladder and dig out the bottom. They still have the ropes they used for hoisting the planck, maybe they could use these to liberate the ladder. Would be best to make one wiki page for newpix 1 first and lay out the basic rules and structure of the page. Then get a script to automate the duplication of this 'template' for all newpix. Then get someone to schedule that for new ones as well. How do we use each wiki page? Could have a section for quotes and links to this forum for posts just after that newpix happend. Good to capture the mood and ideas from that time. In fact it would be interesting to do the first draft with just snippets of forum quotes the newpix created and then add to this later. Also have to decide if the output is just going to be a modified version of the original png in its same size. We could have that only or we could have another section which we fill in with text comments, quotes and writings. This could be designed to take up the same area as the png so that the eventual Bible is made up of the modified png on the top half and the extra text down the bottom half to make it a proper book aspect ratio. If someone had the wiki skills maybe this layout could even be the top portion of each wiki page with a border around it. Then the top section of the wiki page IS the output with the sections below just extra ideas and discussion. A bot could then auto scrape this data into a finished book easily. Anway just Ideas. It's midnight here so I gota coma. New theory: Very short bungee jumps (or fairly painful ones, perhaps). Obvoiously, a female Pope Should be called a Meme. Just sending that out. edo wrote: You must provide a paradox to be worthy, however, no one can deem your paradox' worthiness*. Bribes work only on the uncorrupt members of the Apostate, so bribes will not work on me (PM me your bitcoins). If you just want to join, I can shun you as an unbeliever. Shun! Shun! SHUNNNNNNNN! you are now Transcedental Imaginator of the Western Paradox Church. * the apostrophe police can stick it. Damned if you do, damned if you don't. More of a catch-22, or a single deterministic outcome no? Captain Obvious to the rescue! The dimensions are easier to understand once you realize Randall keeps Megan and Cueball in an ant farm. Produced by the Soilant Corporation.